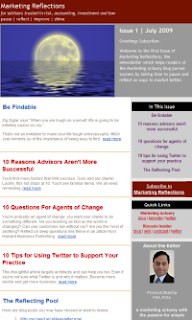 Finally, the Marketing Reflections eNewsletter is ready! In this series, we've looked at why you need an eNewsletter, answers to your three biggest objections and the eMarketing service selected for the experiment. You'll find nice templates in Benchmark Email. I selected one that looked like this blog and then fine-tuned. The process is fairly easy but skippable if you're not particular. Adding content is fairly easy too. Your eNewsletter is divided into sections. You edit a section at a time. You can add new sections by dragging and dropping them. We novices get professional results simply. You can see the results in the screenshot to the right. You can send yourself test emails until you're satisfied. Originally, only advisors in my Outlook contacts were going to get subscribed automatically. I exported the full list in CSV format into Benchmark Email and started pruning through the names. Over 1/3 of the contacts got chopped. Each one volunteered to connect to me. How rude to exclude them from the mailing list. I was simply going to invite them to subscribe if they chose. That creates extra work for many, and reduces the potential readership. To be courteous, I decided to subscribe them myself. Luckily, exporting/importing is easy. I made separate distribution lists for each source and then merged them into a master list. My LinkedIn connections come from diverse fields and different countries. I removed the names of those who are not in financial services. Then I remembered the risk of making assumptions about what others want. This is described in excellent book The Invisible Touch by Harry Beckwith, which I finished reading that day. In the fascinating Trading Up, Michael Silverstein explains how we buy what we want by distorting our spending. Do we read any differently? Twitter shows how eclectic our interests are. Look at someone you Follow and see the diversity in who they Follow. You can also look at Facebook and LinkedIn but you'll see more homogeneity. We appreciate an acquaintance taking the time to send us hand-selected clippings ("I thought you might be interested in ..."). That's what Marketing Reflections does. So I subscribed my entire LinkedIn network. I then sent a note explaining what I'd done, asking for forgiveness if I'd been presumptuous, and offering to remove anyone who asked. A few asked to be removed but more thanked me for thinking of them. You know about the 291 business cards I've been processing. I'll add those names to the distribution as time allows. I wish I had an assistant. The first issue gets distributed on Thursday morning. My nervousness is subsiding. There's still time to subscribe by clicking below. Advance response has been favourable. Better connections with connections. Your own eNewsletter can do this too.